Sriz Beauty Blog: Surf It All and Surf It Fast with UC Browser!!! In India, Cricket is just more than a sport and undoubtedly it is unsurpassed by any other sport in the country. Despite its foreign origins, cricket has found strong roots within Indian culture and magically transformed not just the way the game is played, but how it is received as well. Inspiration-Passion-Devotion-Obsession, cricket evokes myriad responses across India. But what is common is that India rejoices every time Team India wins and despairs at every loss. People in India are just passionate about this game and even for the players themselves feel it as their responsibility and also proud to represent their country and more importantly winning the game for their country and for the millions of people whose enormous support is always behind them. With the advancement in the technology, people are finding different ways to see their favorite sport without missing a single moment. These days with the development of technology, people love to watch their favorite match in their smart phones, which is one of the easiest ways. So, the need for a perfect mobile app, which can telecast the live matches, became very important in the present days. One such effective mobile app is the UC browser, which is a specially designed sleek internet browser for mobiles and tabs, compatible to both Android and Windows phones, for easy and fast surfing of the net. It can be downloaded for free from the Play store on android phones and from market place on windows phones. It is very user friendly and it loads pages super quickly and we can browse multiple pages at a time with its tabbed option. It also has a speed dial option during the launch, which helps in quick access to our favorite sites like Facebook, Book my show, PayTM, Flipkart, Quikr, OLX etc. ; we can even play games. UC browser has got a new special integration called UC Cricket, which is a space dedicated on the browser for every cricket fan, which connects them to the game, where ever they are with high picture quality and seamless transitions without getting stuck! 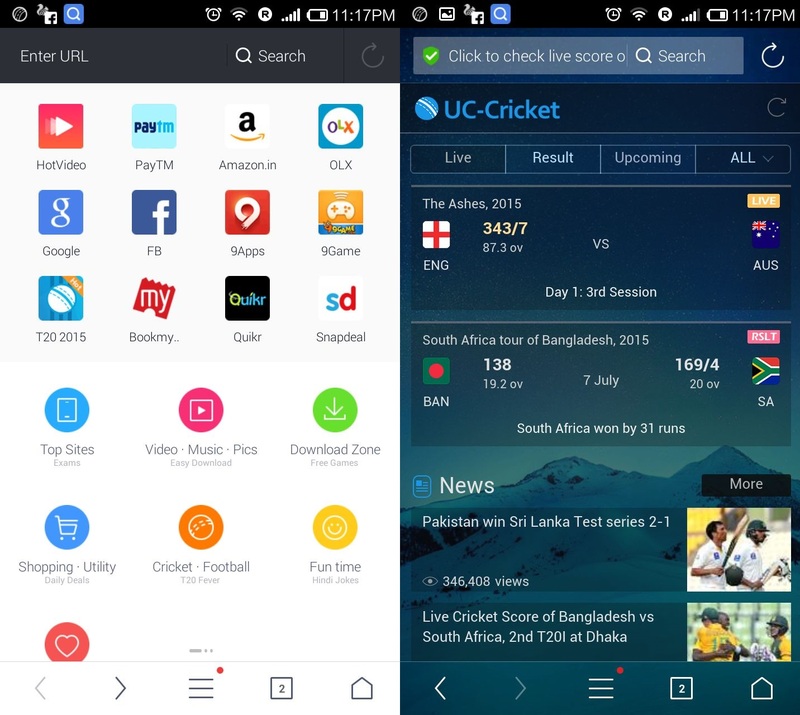 Overall,UC Browser is an all-in-one cricket browser which keeps fans updated with the live scores, results, upcoming match information and lot more on International as well as domestic cricket. It also has a real time notification tab, which runs continuously in the back ground and gives updates on live scores and updates. I have already downloaded this super amazing UC browser, as I am also a big fan of cricket like every Indian ,who never wants to miss even a single moment of the game .Now I can surf it all and surf it fast with UC Browser at any time and at any place even when I am at work or in a function or in a date!